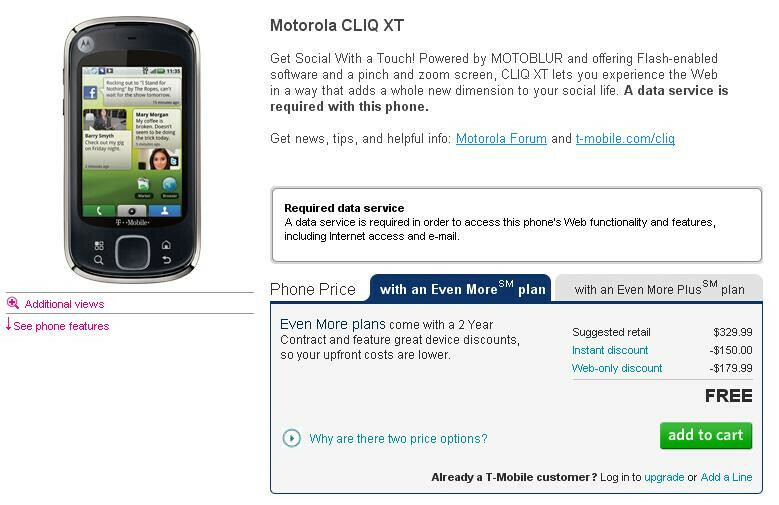 Back in March, we reported that T-Mobile passed along to their sales people a brochure showing how the Motorola CLIQ XT could be sold in 60 seconds or less. Now, the feat is a lot quicker to accomplish thanks to a special offer from the carrier. Simply sign your name to a new 2 year contract and T-Mobile will give you the CLIQ XT for free. It takes much less than 60 seconds to say the word "free". So what are you getting for nothing? The handset has a 3.1 inch HVGA screen, a 5MP camera, MOTOBLUR and pinch to zoom navigation. All that in return for giving the carrier 2 years of your life. Actually, if you were planning on surprising your graduating senior with a cellphone, this might be a great deal. You're getting an Android device for free, your kid will probably love the social integration of MOTOBLUR, and all that is required from you is to sign the 2 year pact and pay the monthly bill which includes a required data plan.